Yesterday morning I noticed a small note by my car door. I could tell it was some sort of list and curiosity got the better of me. The note seems to have been stomped or maybe run over by a wheel. Apparently Mel may or may not get stuff for lunch. I especially like the Quayle-esque spelling of Burritoes; it really rolls off the tongue when you say “burritoes” out loud; sounds almost like a British member of the House of Lords is visiting the local Taco Palace. The irony of Diet Dr Pepper in light of the other items probably speaks for most of us: first on the list: Mayo! 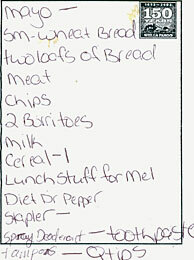 Followed by a ton of bread, chips, cereal, milk, and of course, two burritoes. Notice how some things are conspicuously numbered (Cereal-1) while other things have a hyphen added but no quantity. Deodorant is often misspelled, so that is not in itself interesting. What is curious is that she has to remind herself to buy spray. Maybe she nabbed a roll-on by mistake? Deodorant is very specific, “meat” is most generic; almost primitive. Did the Q-tips remind her of tampons or vice versa? Does she work for Wells Fargo or just swipe their note pads when she visits the bank? Only Mel knows.